A 56-year-old Indian male, silversmith by occupation, presented with gradually progressive loss of vision in both eyes. Best-corrected visual acuity in the right eye was 6/9 and in the left eye was 6/60. Lid and adnexa were normal. In both eyes, conjunctiva had gray-black pigmentation of medial bulbar conjunctiva, which was more prominent at the medial canthal region. Cornea had diffuse confluent deposits at the level of Descemet's membrane [Figure 1], which were seen as hyperreflective shadows in anterior segment optical coherence tomography (OCT). Lens showed nuclear sclerosis grade 2 with posterior subcapsular cataract in the right eye and near mature cataract in the left eye. Intraocular pressure, gonioscopic evaluation of angles, and specular microscopy were normal. Fundus evaluation was normal in the right eye while details in the left eye were not clear due to dense cataract. B scan in the left eye was normal. 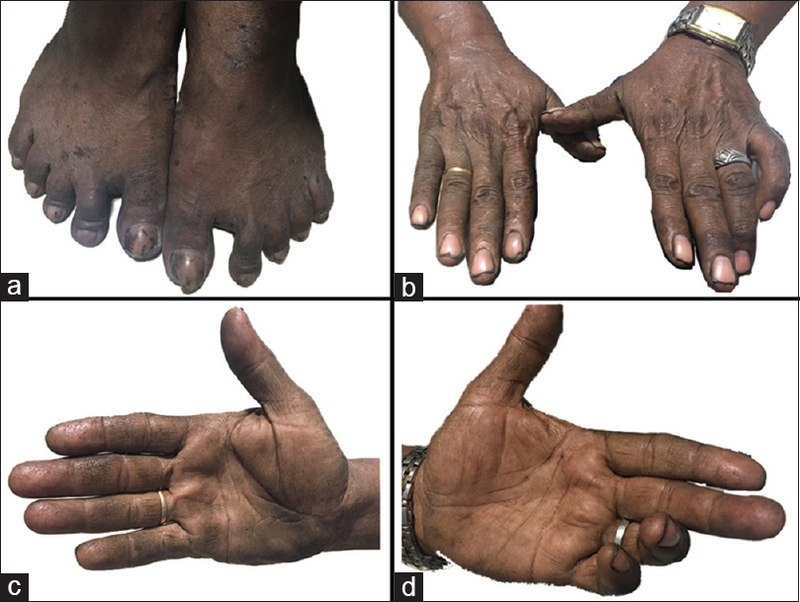 Upper and lower limbs showed slate-gray pigmentation along with pigmentation of nails [Figure 2]. Serum silver levels were raised, 2.3 μg/ml (normal <2 μg/ml). 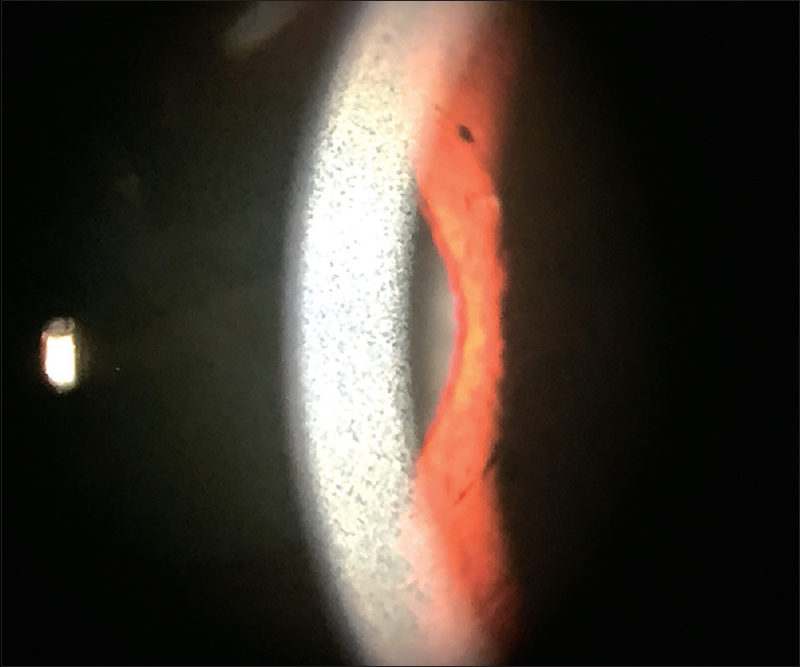 After written informed consent, patient underwent left eye manual small incision cataract surgery, during which lens matter was collected and sent for histopathological evaluation. It showed evidence of diffuse deposits of silver which were confirmed using hematoxylin and eosin (H and E) stain and were refractable in dark field illumination [Figure 3]. Post cataract surgery, patient underwent Humphrey's 30-2 visual field analysis, macular optical coherence tomography (OCT) and fundus fluorescein angiography (FFA), which were normal. Silver deposits can be noted in the elastic fibers of the connective tissue and basement membranes including the eyelids, conjunctiva, lacrimal sac, lens, ciliary body, and Bruch's membrane. In cornea, deposits have been noted within Bowman's membrane, corneal stroma, and Descemet's membrane, causing its discoloration.,,, The presence of silver in a cataractous lens can be debated as silver deposits in senile cataract or cataract induced by silver deposits. We would like to thank Dr. Shanthi R, Ocular pathologist, Aravind Eye Hospital, Anna Nagar, Madurai for doing histopathological evaluation of the lens matter. Kamath Y, Sinha A. Ocular argyrosis in a jeweller. BMJ Case Rep 2013;2013. doi: 10.1136/bcr-2013-009742. Pala G, Fronterré A, Scafa F, Scelsi M, Ceccuzzi R, Gentile E, et al. Ocular argyrosis in a silver craftsman. J Occup Health 2008;50:521-4. Wadhera A, Fung M. Systemic argyria associated with ingestion of colloidal silver. Dermatol Online J 2005;11:12. Tendler I, Pulitzer MP, Roggli V, Abramson DH, Marr BP. Ocular argyrosis mimicking conjunctival melanoma. Cornea 2017;36:747-8.